Easy and Free Dry Polishing Kinds of Stone. Standard 2.1mm thick, 4" diameter, 8 pieces diamond polishing pads set for dry polishing of marble and granite contoured and straight edges. Can also be used to polish cured concrete. 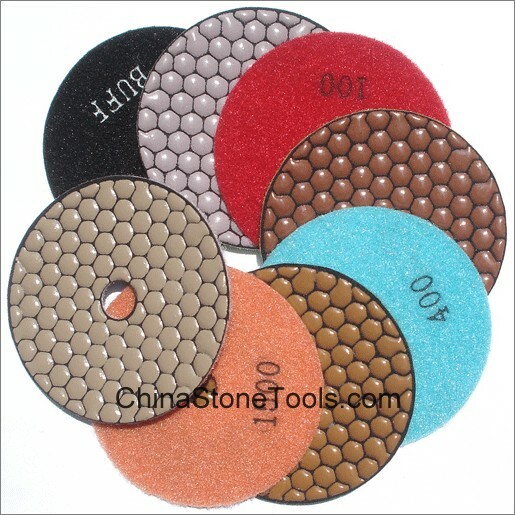 These are the HIGHEST QUALITY diamond polishing pads available from China today. Maximum 5000 RPM. Velcro backing for quick pad changes. Available in 50#, 100#, 200#, 400#, 800#, 1500#, 3000# grits & Buff.